Professor Cristina Villalobos, instructs John Cortinas, of Mission, using the active learning model in which they dedicate more class time to active engaging and less to lecturing at UTRGV on Friday, Jan. 25, 2018, in Edinburg. EDINBURG — Once a week students in professor Cristina Villalobos’ Calculus I class form groups of four to solve math problems. They are encouraged to talk to each other, use their phones to create graphs and ask as many questions as possible. 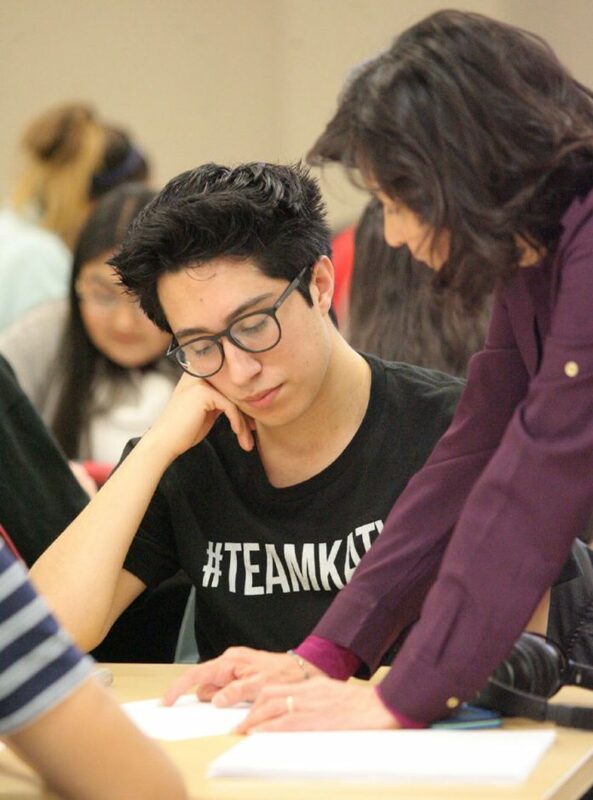 Since 2016, Villalobos and other professors in the School of Mathematical and Statistical Sciences at the University of Texas Rio Grande Valley have been rolling out the implementation of Active Learning in their introductory math courses, mainly Pre-calculus through Calculus II. The idea is to keep those who are entering STEM related fields — Science, Technology, Engineering and Mathematics — from becoming discouraged due to lack of understanding. This is the main idea behind a nationwide initiative called SEMINAL — Student Engagement in Mathematics through an Institutional Network for Active Learning — for which UTRGV was just selected to participate alongside 11 other universities from across the nation. The initiative is funded by the Association of Public & Land-Grant Universities, which provided a $3 million grant to the selected universities, which will work as a team to find ways to spread the use of this method when teaching these courses. This method means modifying the structure of a regular class to have more practice and active engagement time and less lectures. In the class of Timothy Huber, school of mathematics interim director and associate professor, this has led him to create videos of his lectures that are assigned to students as homework. After watching the video, they must complete a quick quiz to verify they watched the lecture to then put that new knowledge to practice while in the classroom. “That’s one type of active learning, where you take the non-active, one-way conversation and you put that outside of the classroom and in the classroom you do something that is group oriented,” Huber said. The students had time to process the lecture before arriving to class and then asked questions on whatever it is they didn’t understand, he added. Because they were expected to practice in class rather than at home, they had the professor there to answer those questions. There is no specific way of implementing the method, but it does call for more overall practice while in the classroom to allow students to pinpoint areas in which they struggle while they have the support of tutors, classmates and professors. Lecture takes a backseat during this time. Using the grant, professors will be developing a game plan to revamp the implementation of these methods in their classrooms and use undergraduates and graduate students as tutors for those coming up the pipe. The hope is to have one tutor per 15 students supporting the active learning initiatives aside from the professor. Having peers as their tutors might help those who could shy away from asking questions to the professor or even encourage those who think they are not fit for those majors, they said. Five professors are leading the initiative including Huber, Villalobos, Pierce, Anahit Galstyan and Andras Balogh. Starting this fall, they will collect performance data such as passing rates and student feedback, to then share with the other participating universities over the course of the two-year grant. One of the main purposes is to also provide tutors and support to every professor in the department so that they can also begin adopting this method in their classrooms.